When I held little Abby Rose in my arms the very first time nearly four years ago, I looked into her puffy blue eyes and I knew we had just begun a grand adventure. I held my finger out for her to grab and I was certain in that moment that this would be the greatest journey of my life. I still feel that way. Since the day she was born, I’ve made a point to take a lot of pictures. I take pictures around the house, in the grocery store, at the dentist, in the sandbox. 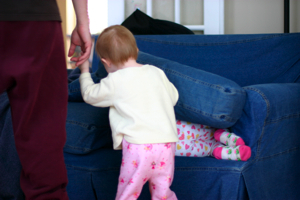 I’m not a great photographer, I’m just a mom who savors the small stuff from the messy faces and crayon drawings on the wall to the humor of watching a child “hide” in plain sight under a couch cushion. Of course I take pictures at birthdays and holiday parties, too, but my favorite pictures always seem to come from everyday life. I love documenting the moments that warm our hearts when they happen and make us wish later that we could hit a rewind button and experience them again. My camera helps me get those moments back. I don’t know exactly when I settled on this notion, but early in my life I realized that I didn’t need to travel far to have an adventure. I go places all the time by reading books and interviewing people from around the world. Heck, taking a different route to work or striking up a conversation with a stranger can lead to a new discovery. At home, I snap pictures like a hyperactive tourist, treating every day like an event. I study the shapes of clouds, flowers and trees and encourage my girls to seek their own beauty every day, too. Today Abby pointed to the windows of the building where I work and said the strange white pieces around the windows looked like teeth. That thought never occurred to me, but I was delighted by her observation. A child’s imagination is a beautiful thing. One of the best parts of being a mom is getting to see the world all over again through the eyes of my two little tour guides. 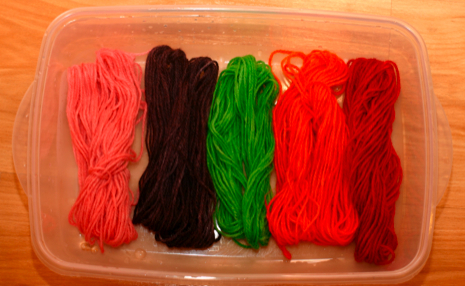 After Amelia tuckered out this evening, Abby and I dyed wool yarn with Kool-Aid for the first time ever. Both rookies, I read some general directions out loud and then we discussed how we wanted to proceed with our project. 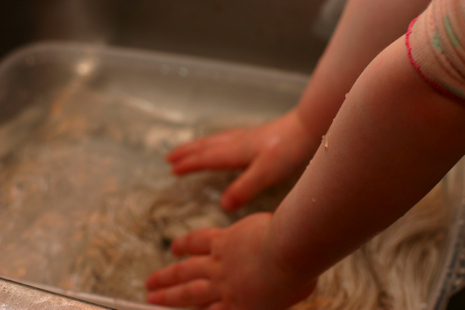 We used an over-turned chair to wind mini-skeins, and then I let her soak them in a tub of water, reaching for my camera to get a shot of her excited little hands splashing in the kitchen sink. The purpose of the project was to experiment with Kool-Aid so I can write up a basic tutorial for my weekly art & craft column. Usually, I test the projects alone, but it it was so much more fun with Abby’s help. She mixed up the non-toxic and wonderful smelling dyes and dropped in the yarn. As we waited for the lemon-lime yarn to “cook” in the microwave, she reminded me that “we forgot the music.” We usually turn on music to dance to when we make projects in the kitchen. So, I flipped on a local pop/rock station. “Is this kinda like rock’n roll?” Abby asked.